A house came on the market this week in Atlanta, and it is a beauty. Built in 1920, it is a classic Tudor design, but the interior has been completely remodelled and updated. I have always admired the look of the Tudor style, and gravitate to Tudor/gothic motifs such as quatrefoils, arches with points, heavy fireplaces. 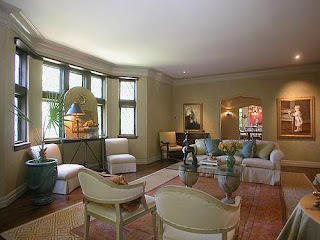 A Tudor house in combination with a beautiful interior is a homerun in my eyes! 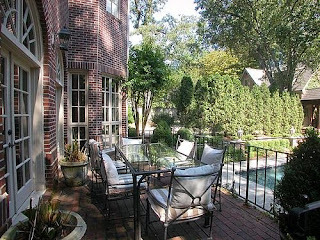 This home sits on one of the most prestigious streets in Atlanta. 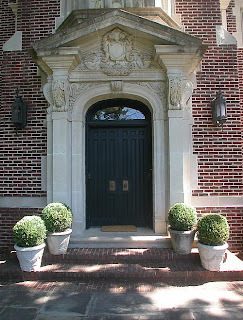 Notice the beautiful detail in the stonework, the two lanterns flanking the front door, and the potted shrubs. 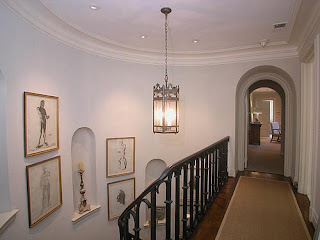 The entry has a beautiful staircase and sconces, and look at the shape of the opening to the living room - I love that shape, and it is so appropriate for a Tudor house. The dining room. The painting is by Haidee Becker, who is represented by Tew Galleries in Atlanta. 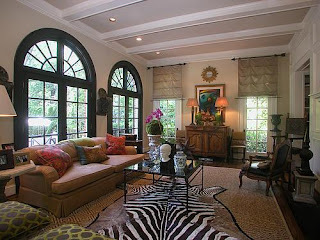 The living room - there is that sisal that is so popular these days, with a rug layered on top. 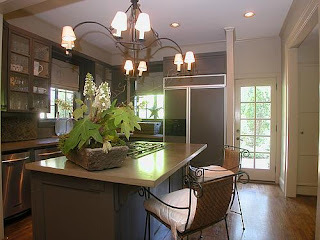 I love the color of the cabinets in the kitchen - a dark gray. The family room. I am unclear whether this adjoins the kitchen, but it looks like a nice bright room, and overlooks the back yard. The upstairs hall has a lantern - very appropriate given my last post on lanterns! Isn't this bedroom beautiful? 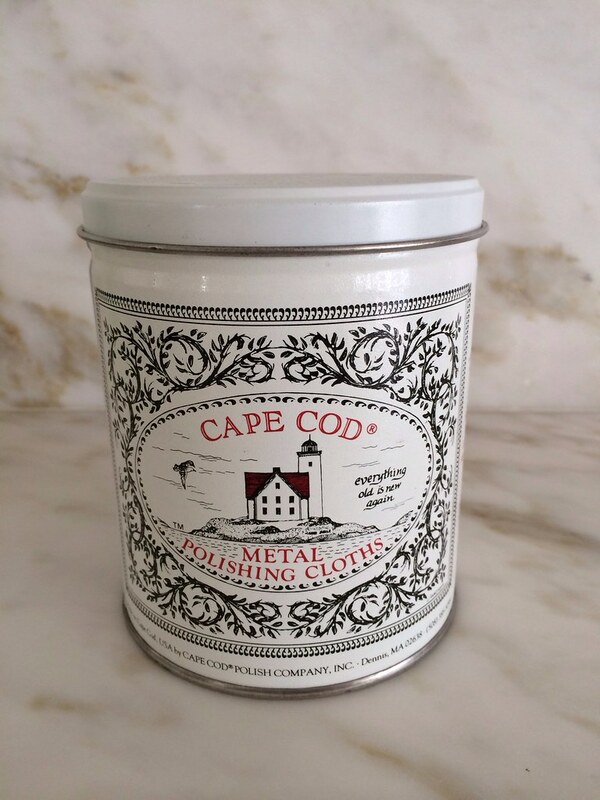 It suits my taste perfectly, as I love light and airy cream/white/soft blue bedrooms. The gray painted chest is the perfect touch. Here is the sitting room to the master. In my mind, I imagine that this is a very sophisticated teenager's room. 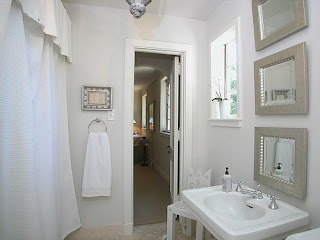 The details are great - the cutout of the cornice, the contemporary mirror. I am sure this picture was photoshopped, but it seems to be so light and bright. One of the upstairs bathrooms. Isn't this an interesting arrangement of mirrors? I like it. 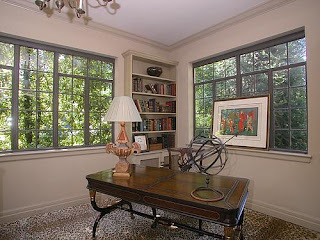 This room is noted as the sunroom. I can't tell whether it is upstairs or downstairs. The walk-out terrace off the family room overlooks the pool. Here is a view of the house from the back. I love how the terrace has steps down to the pool. This home even has a guest house, which looks like it is used as a teen hangout. Here is the inside of the guesthouse. 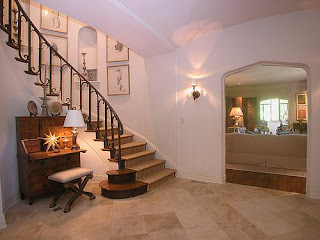 I love the quatrefoil motif on the floor. All this can be yours for $3.2 million! Actually, this is a very good price for a renovated house in the heart of Buckhead. If anyone knows the name of the designer who worked on this house, please let us know. 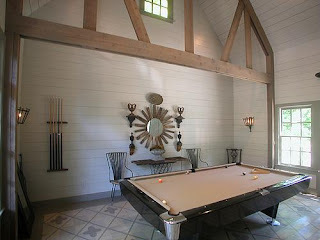 It is quite a beautiful home, in large part because of the gracious design inside. Wow. This is beautiful...I can't even pick a favorite room. I love them all. Great post! Wow ditto! 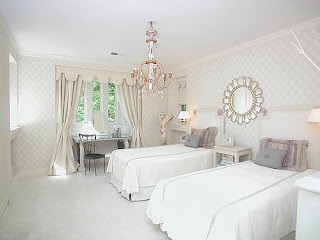 Just beautiful = I love the master bedroom. 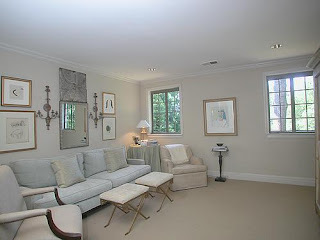 It looks like the sunroom is off the family room - there's bookcases just off the second view on the right. I love this - sooooo pretty!!!!!!!! Big win with this one. Let me know who the designer is when you find out. Hi Lipstick and CDT - thanks for stopping by. I adore the master too. I could be very happy with this house (based on the pictures) - I would love to see it in person to see how it flows! The master is definitely to die for. 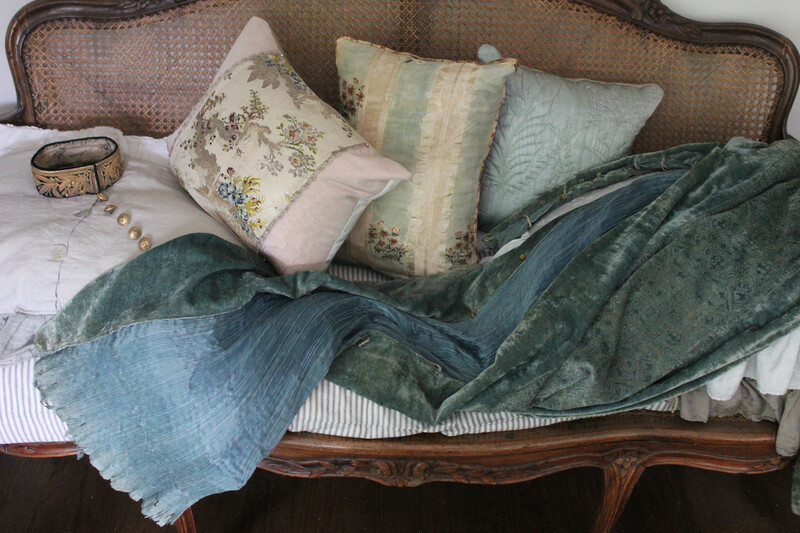 I think that the pillow is Leontine, don't you? Gorgeous. I love that master bedroom too. I'm trying to update my bedroom and I keep thinking about pops of bright colors but then I'm always drawn back to the softer colors like this room... decisions, decisions! Ps- thanks for stopping by my blog and I hope you have a WONDERFUL trip!!!!!! I just kept saying, Oh, Joni - Cote de Texas would love this place! Lots of sisal and gray and totally up her design alley. 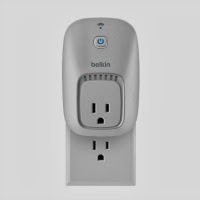 3.2 - bet it will not sell for that in this market - but if it were in NY - I'd rush out and "look" at it! Good Morning...ummm...Gorgeous indeed...I so look forward to your emails to inspire me daily...thank you soooo much...keep the *good stuff* coming!! Sincerely, Valerie, Manitoba, Canada. OMG, It's wonderful. I'm ready to move in. I wouldn't change a thing! 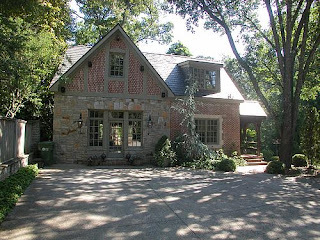 Atlanta is just a treasure trove of beautiful homes, and this one is just gorgeous! Gray is ever- popular, and these photos are perfect examples. I would love to do a drive by- is it possible to share which street it's on? Thanks for another great post. Oh I love the front door....so grand...and the pale grey theme througout the interior...hints of Swedish elegance...my favoirte! BEAUTIFUL house, great find! Thanks for the eye candy. Oh wow, I'm blown away. The backyard is fantastic. I would redo the kitchen in a hot minute, though. That is my kind of house! I love it all! Thanks so much for showing it! The Guest House has won the prize for me! Would I be right to hazard a guess that the Designer of this stunner did not do the Kenny Rogers property of your recent post? Fabulous post - so much beauty & elegance to end the week! But the house is gorgeous!!! I love especially the exterior.. It almost looks like a house built for a love story to happen in it! A truly beautiful home. I've seen it from the street. The bedroom could have been done by Phoebe Howard from "Mrs. Howards" and "Max and Co." fame. Two wonderful stores in Atlanta and Jacksonville Fl. The master is definitely her look. That's a lot of house for $3.2 mil...shame I don't have that kind of scratch. so many new beautiful pictures for my inspiration file! i wandered over from the fab maison21, and am so glad I did! Beautiful home. I envy the lucky teenager that would have such a bedroom. 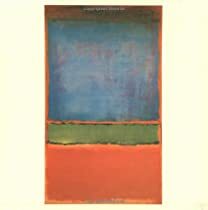 (And I agree with you about the price--what a steal). 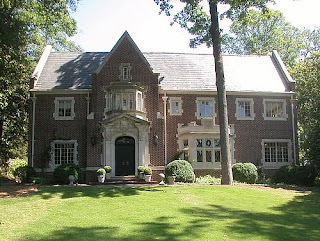 Thanks for the lovely example of American tudor style architecture-what a glamourous house! The house sure does look nice in photos, but unfortunately it is WAY over priced. The kitchen is tiny, there is no garage, the master bathroom is terribly outdated, and actually the whole upstairs is terribly outdated. The secondary bedrooms are very small. There is no basement either. I wish everything was as good as it looked on the internet! P.S. That lantern is glorious too! Great find you! What an AMAzing Home!! My favourite is the living room with the zebra rug and lucite benches and the White bedroom with two twinbeds - so light and airy and simply fantastic! I think I need to move to Atlanta!! 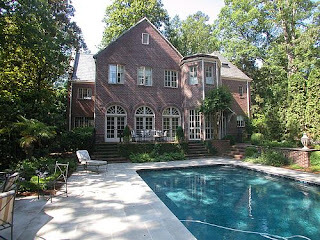 This is a gorgeous home, wish I had the millions that I could buy and move to Atlanta! Gorgeous house... wish it was in my neighborhood for sale! This is just beautiful. I would want all the furnishings as well. this house is to die for! nuf said. What a gorgeous home! It is so regal and elegant. I love the facade and I won't even start on the interior, it's just dreamy. How are things in Atlanta? 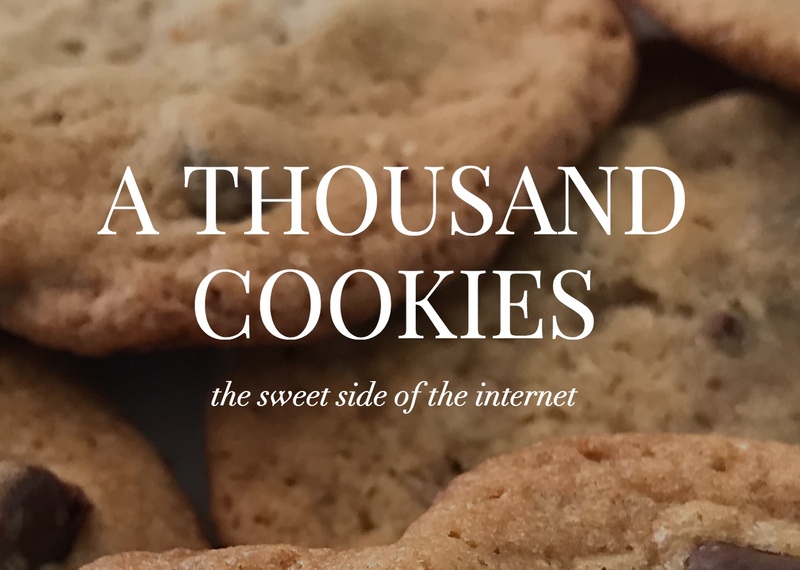 We miss you in the blog world. :) Hope you are enjoying the summer! I heart the living room. 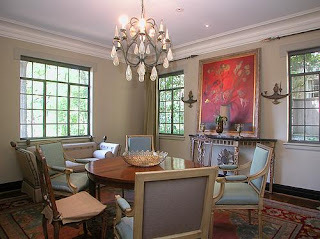 So gorgeous and so spacious...perfect for formal and even casual get together. Love the rug.